GET YOUR BUSINESS ISO 45001 CERTIFIED! ISO 45001 puts your organisation on level of excellence shared by organisations worldwide. It satisfies demands of current or prospective customers for registration and gives you access to a superior pool of clients who seek out competent businesses with certification. Offers increased acceptance by regulators, the public, and interested parties. Accepted as being proactive in relation to Health and Safety and continuous improvement. Improves business performance. A well designed, well implemented ISO 45001 health/safety management system reduces workplace illness and injury and increase productivity. 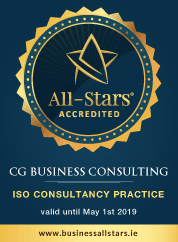 CG Business Consulting guarantee certification. We have a 100% Success Rate. Complete the form to get a free ISO 45001 consultation for your business NOW from the experts.